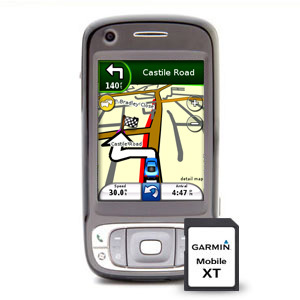 Add full-featured navigation to your GPS-enabled smartphone with Garmin Mobile XT. Just plug this data card into your compatible phone¹ (see specs tab) and start navigating. Garmin Mobile XT puts pre-loaded maps, spoken turn-by-turn directions, real-time services, and many more great features in the palm of your hand. With a price of just $99, you’ll have everything you need to navigate your day. And with no recurring subscription fees, you can make the most of your phone while you’re on the go. © 2007 Map World Services 2000 Inc.
Map World Services 2000 Inc.